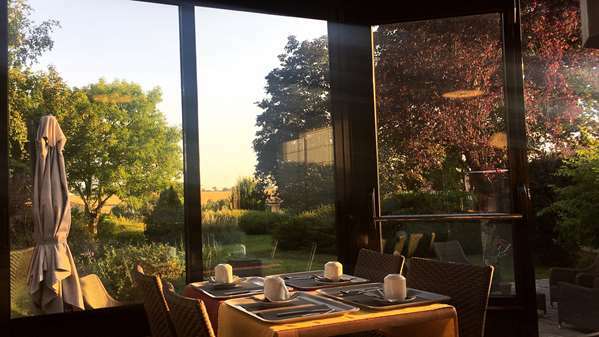 Our 3-star Hotel Kyriad Angoulême Nord - Champniers invites you to the heart of Charente. 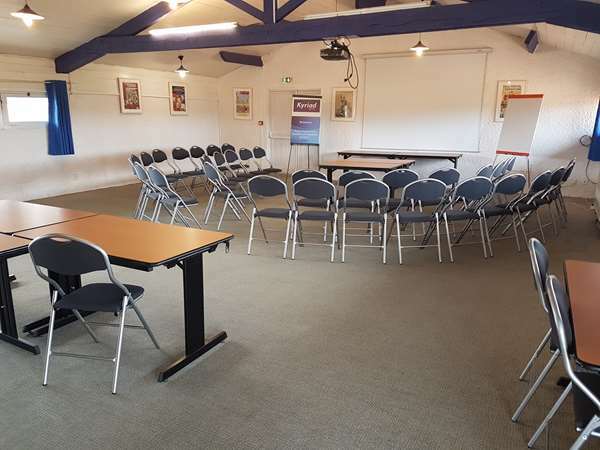 200 yards from the Angoulême Nord exit off highway N10, just over 4 miles from the city center and the train station, 1 mile from Angoulême-Cognac Airport and 5 minutes from Espace Carat, our hotel is right at the entrance to the Angoulême agglomeration. Come discover the cellars of Cognac and Pineau des Charentes, take part in the Comic Strip Festival, the Francophone Film Festival or the Musiques Métisses Festival. 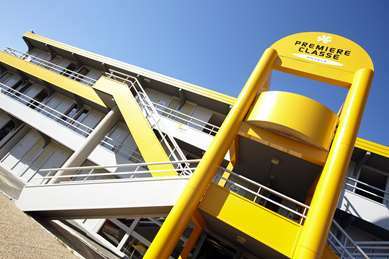 We are just 10 minutes from the city center and the Cité internationale de la bande dessinée et de l’image (museum and exhibitions of cartooning and images), 2 minutes from the Montagnes commercial district, 5 minutes from N°3 l’Isle d’Espagnac industrial zone and 5 minutes from the Parc des Expositions by car. You can easily access the highway to Cognac, la Rochefoucauld or Val de Charente. 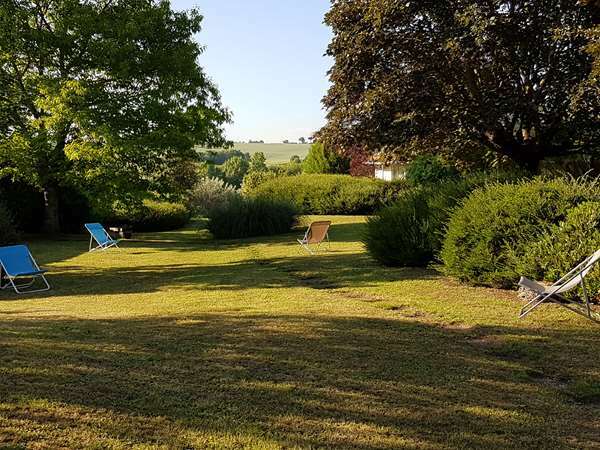 You will be in a quite setting, with renovated rooms, overlooking a shady garden that you can see from your large bay windows and the terrace from the breakfast room. You can also take advantage of our exclusive Wi-Fi+ service: a free broadband Wi-Fi connection throughout the hotel to freely surf, chat and watch videos at will. 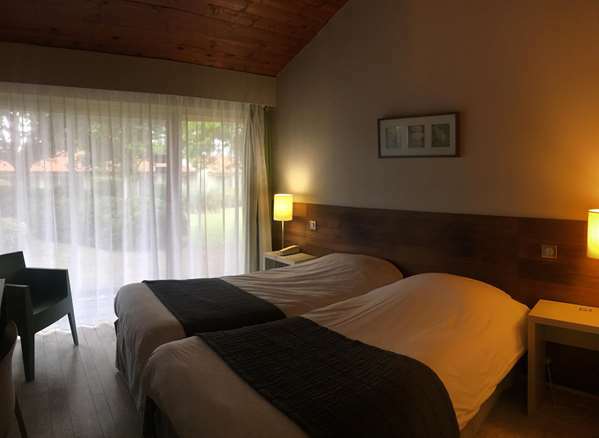 All our rooms are equipped with 26-inch flat-screen TV with 24 channels, ventilation, free unlimited Wi-Fi, a desk, telephone and alarm clock. 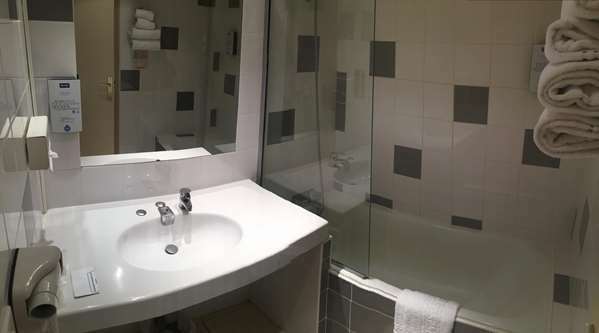 The bathrooms are equipped with a bath or shower, hair dryer and toiletry products. A courtesy tray is at your disposal with coffee, tea, cookies and a kettle. 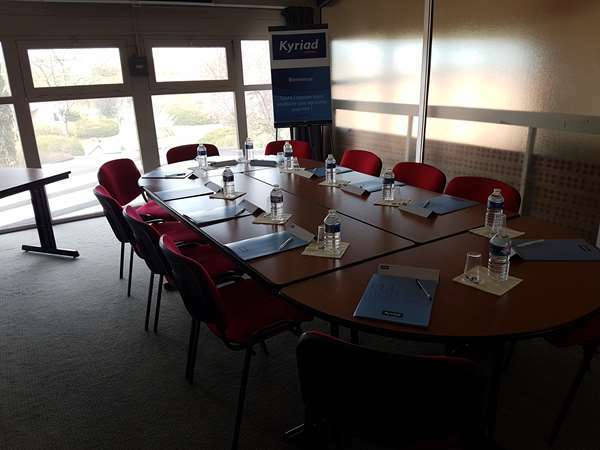 Hotel Kyriad Angoulême Nord - Champniers has 41 single-storey rooms for 1 or 2 people with large beds or 2 single beds and family rooms accommodating 3 or 4 guests. These quiet, renovated rooms are very spacious (250 sq. ft.) and very bright. 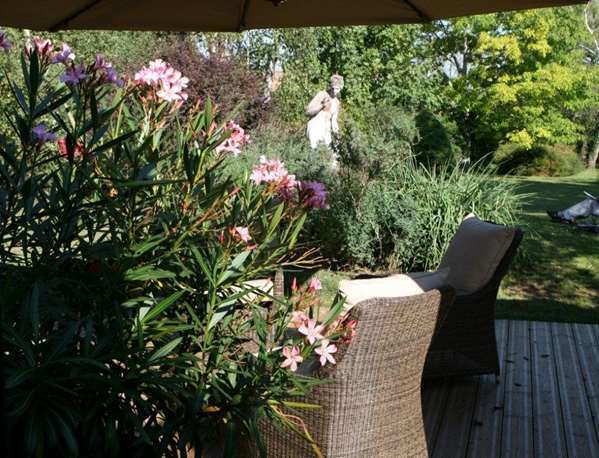 You can have breakfast on the veranda overlooking the landscaped garden. 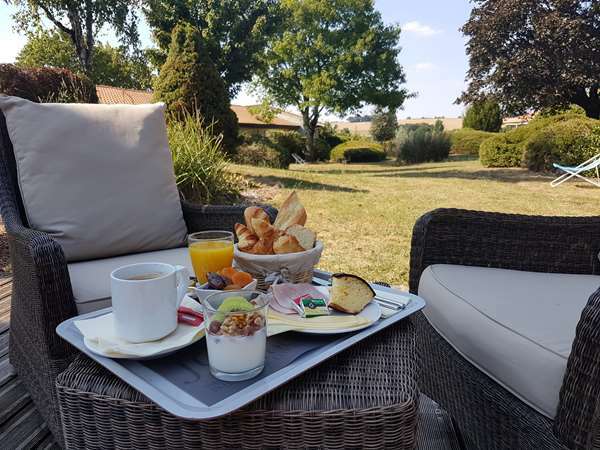 In summer you can have breakfast out on the terrace with your all-you-can-eat buffet offering pastries, bread, dairy products, yogurts, ham, cheese, fromage blanc, fruit salad, fresh and dried fruits, fruit juices, jams, cakes, etc. Again the best days of this hotel (typical of this brand) are behind it! However the staff were helpful and the breakfast was adequate. This hotel is easy to find and has accessible access to rooms from the car park. We picked this motel as it was en route from Southern Spain. The bed was comfy and air conditioning great.....even though our room was in the middle of a refurb ? We were not told this when booking....so with panels missing off walls and half tiled bathroom and loose toilet ....we actually had a nice sleep...due to the fact we were tired after a days driving (700 miles) . Just like the other Kyriad hotels on this and prior trips, this one did not disappoint. Clean, quiet and reasonably priced accommodations in easy to reach locations are what we look for. The layout of this hotel was different than the others. It is one level, with an enclosed inner hallway that is accessible through the lobby or from a number of outside doors. Like the other Kyriad locations we've stayed at, this one was clean, quiet and appeared to be recently renovated. The room had a comfortable bed and opened onto the inner yard through sliding doors (which we did not open). I slept as well as on any night of this trip - it was completely quiet at night. We chose to have the buffet breakfast which was an additional 9 or 10 Euro per person and it had bread, yogurt, fruit, cold meat, coffee and drinks. Parking and WI-FI were included. 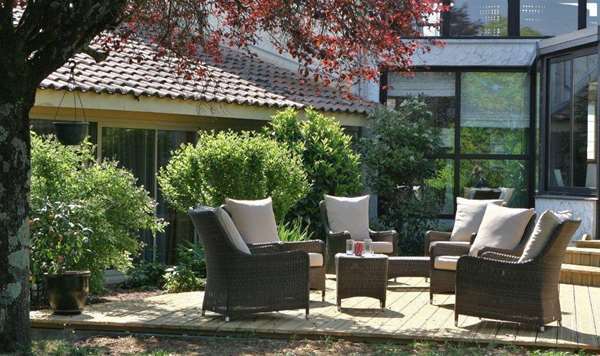 The location is easily accessible from the highway (N10 and N141) and a 10 minute drive into the picturesque old town. All in all, a very satisfying stay. Thank you so much! Hope to see you again!